I went gliding! And it was awesome. My friend and co-worker Jelle Vandebeeck has been a glider pilot for (what he claims - and I have no reason to doubt it) 15 years now. Last year, just for fun, I mentioned I would like to get off the ground with him (in a glider, of course). He wasn't dismissive of it, so we went to search for a good date. Unfortunately, due to scheduling conflicts and weather conditions I didn't get the chance to actually go flying. No worries, there would be other moments. And so, now that flying season started again, there were no races to be flown yet, the weather looked good and I was able to free some time (there's always so much to do, but it's about setting priorities), which meant that this weekend we were on! And so I arrived at the airfield in Brasschaat at around 14:45. First thing Jelle warned me about: there would be a lot of waiting. There's only so many (twin) gliders in the club, and there are quite a bit of people wanting to go in the air, and so we had to wait our turn. I was very much fine with that. The weather was good: blue skies, sun was out but it wasn't too hot yet; a light breeze helped cool us from the spring sun. And so we waited until it was our turn. Then, we geared up ("so how does this parachute work exactly? ", "don't touch this or we'll lose the cockpit", ...), they sat me down in the second seat of the glider and Jelle explained what dial was used for what purpose. To be honest: I'm not the stupidest guy in the pack, but it was a lot of information to take in, even though I wasn't going to do any flying myself. But then again, it was the first time I set foot in a glider, or in a small airplane all together: all the other planes I've flown along with were quite a bit bigger. 😅 My gear - I had my camera with me - was tucked away by my side, because I was told that the ride may be a bit bumpy. This apparently had to do with the weather: the sky was virtually clear except for a few patches of clouds here and there and the sun was out. This meant a lot of heat was generated at ground level. Heat means rising air which is good for a glider but this also meant a lot of agitation: the forces of nature helping us up could also be a bit quirky at times. They would also have effect on my feeling of balance: I was given a small puking bag just in case. I wouldn't have been the first to throw up in the back seat of a twin glider, I've been told. And then, then we got hooked up to a pulling plane, which revved up its engines and off we went. 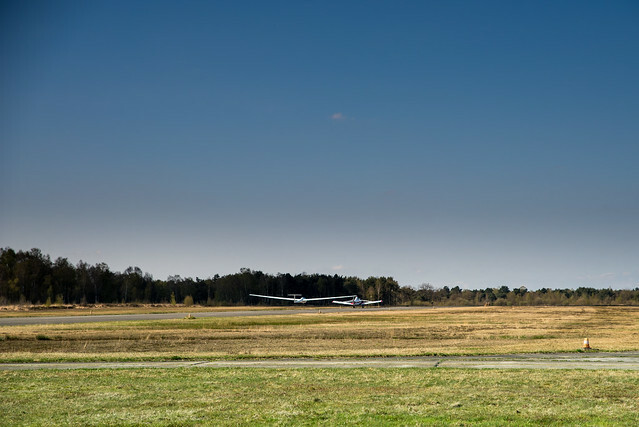 The funny thing is that because the glider has more natural lift, it goes up in the air sooner: there's a few seconds of hovering a few meters above the tarmac when the other plane was still speeding up on the ground. But then you're both off and before you know it, you're at 500m and it's time to let go of the umbilical cord attaching the glider to the plane. And then you're free. I have to say: it was an incredible experience. I've always loved flying even though I don't do it that much, and most planes I've flown in were big boys. But I love a seat near the window to peak outside, even during landing and takeoff. I guess it's a typical boyhood fascination that never receded. But being in such a small plane, having a great view all around, watching objects on the ground go larger and smaller as you drop or rise, and being able to see so much farther away than on the ground: it's awesome. Also, the noise was not to hard: there's no motor noise but you do hear the wind around the plane, and when you're going up you can hear the plane creak due to the forces the thermal rising applies to the plane. Nothing to be afraid of and all in all very peaceful. I'm pretty sure I also have to thank Jelle for that because he really is an expert flyer (at least, to my n00b experiences). I was never scared or anxious; all in all I found the ride to be very smooth, even though he claimed it was quite bumpy (due to the good weather). There were intense moments, of course: when you fly into a pocket of hot air you feel the forces pulling on the plane and on you which results in funny feelings in your stomach. But those are part of the deal and once you get a bit used to them and try to anticipate them they become easier to stomach (pun intended). So yeah: a very nice afternoon indeed. I'd gladly do it again, even though my stomach wouldn't agree now. I'm thinking that once you get used to it and know what to expect, I might become less "unpleasant". We'll see, there might be another time. This post was proofread by: @fousa. Many thanks!